NGT stayed sand mining in CRZ areas of Udupi District, Karnataka. Some sections demand a complete ban on sand mining in CRZ areas. So let’s take a look at what exactly are CRZ areas and which laws govern them. Issued by MoEF under Environment (Protection) Act, 1986. Mandate: Take measures to protect and conserve our coastal environment. Uniform regulations for the entire Indian coastline without taking into account the diversity in terms of biodiversity, demographic patterns, natural resources, etc. 1991 Notification laid no clear procedure for obtaining CRZ clearance. Post clearance monitoring and enforcement mechanism was not laid out. Measures/rules to check pollution emanating from land based activities were not included. Caused hardships to traditional communities living in ecologically sensitive coastal stretches (fishermen, slum dwellers, etc.). Many amendments were made to CRZ notification 1991 and all these amendments were consolidated in the CRZ Notification 2011. The 2011 Notification takes into account and address all the above mentioned issues. To promote development in a sustainable manner based on scientific principles, taking into account natural hazards and sea level rise. 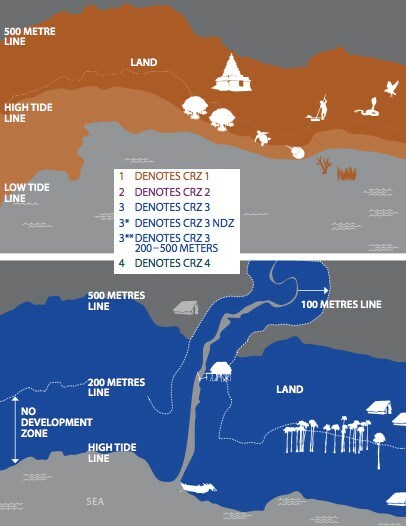 CRZ-IV (water areas upto the territorial waters and the tidal influenced water bodies). A separate draft Island Protection Zone Notification has been issued for protection of the islands of Andaman & Nicobar and Lakshadweep under Environment (Protection) Act, 1986. 1) Ecologically sensitive areas and the geomorphological features that play a primary role in maintaining the integrity of the coast. 2) The area between Low Tide Line and High Tide Line. Construction of trans-harbor sea link and roads without affecting the tidal flow of water, between LTL and HTL. Etc. Areas which are developed upto to the shoreline and falling within municipal limits. Buildings are permissible on the landward side of the hazardous line. Other activities such as desalination plants are also permissible. Some construction is permitted only as per guidelines specified by the notification. Areas that are relatively undisturbed and do not fall under either in Category I or II and also include rural and urban areas that are not substantially developed. Between 0-200 metres from HTL is a No Development Zone where no construction shall be permitted. Only certain activities relating to agriculture, forestry, projects of Department of Atomic Energy, mining of rare minerals, salt manufacture, regasification of petroleum products, non-conventional energy sources and certain public facilities may be permitted in this zone. Between 200-500 metres of HTL, those permitted in 0-200 metres zone, construction of houses for local communities and tourism projects are permissible. The aquatic area from low tide line upto territorial limits is classified as CRZ-IV including the area of the tidal influenced water body. There is no restriction on the traditional fishing undertaken by local communities. No untreated sewage or solid waste shall be let off or dumped in these areas. to promote development through sustainable manner. The Notification allows infrastructural facilities for the local fishing communities to be constructed in the CRZ-III area. The clearance accorded to the projects shall be valid for the period of five years. What is the post-clearance monitoring mechanism? It shall be mandatory for the project management to submit half-yearly compliance reports. 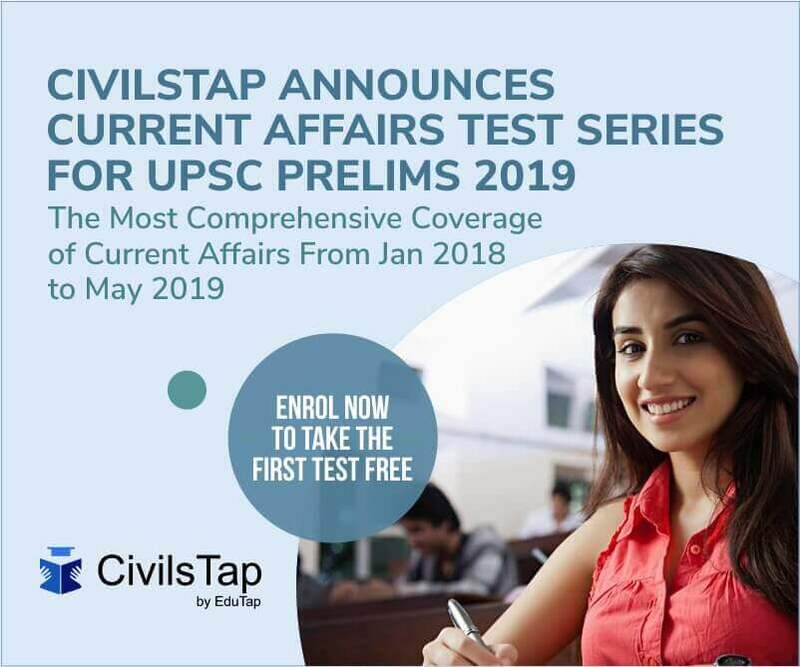 The CZMAs at the State level and the NCZMA, at the Central level shall be strengthened in a time bound manner for effectively enforcing the Notification. The Notification lays out the method and the time frame in which actions shall be taken against any violations. Sunderbans, Gulf of Khambat and Gulf of Kutch, Malvan, Achra-Ratnagiri in Maharashtra, Karwar and Coondapur in Karnataka, Vembanad in Kerala, Bhaitarkanika in Orissa, Coringa in East Godavari and Krishna in Andhra Pradesh would be declared as Critical Vulnerable Coastal Areas (CVCA) and the integrated management plan would be prepared for each of these areas in consultation with the local communities. Beaches such as Mandrem, Morjim, Galgiba and Agonda in Goa have been designated as turtle nesting sites and protected under the Wildlife Protection Act, 1972. No developmental activities shall be permitted in these areas. There are about 500 islands in Andaman & Nicobar and about 30 in Lakshadweep. The geographical areas of some of these islands are so small that in most of the cases the 500 metres Coastal Regulation Zone regulations overlap. Hence, a separate Notification is being issued which takes into account the management of the entire island (except for four islands of A&N which include North Andaman, Middle Andaman, South Andaman and Great Nicobar). Objectives of the IPZ Notification, 2011: Same as objectives of CZR 2011. For the four islands namely, North Andaman, Middle Andaman, South Andaman and Great Nicobar, the Notification applies to areas within 500 metres from the High Tide Line along the seafront, while for all other islands of A&N and Lakshadweep the entire geographical area, including the water area upto 12 nautical miles falls within purview of the Notification. The committee was headed by Sailesh Nayak (Former Secretary of the Earth Sciences Ministry). It was commissioned in June 2014. It was commissioned after states expressed dissatisfaction regarding the limitations set by the CRZ notification of 2011. The report was submitted in January 2015. The committee recommended several relaxations in the terms set by the 2011 notification. The recommendations have been put forth with the objective of giving a boost to tourism, port construction and real estate. It endorsed the dilution of regulatory powers held by the central government in coastal areas. The committee has suggested that the central government’s role in coastal areas be limited to environmental clearances and regulating environmentally-sensitive areas. Construction, except those requiring environmental clearances, should fall under the ambit of the state and local planning bodies instead of being regulated by centre. Urban planning rules prepared by local authorities be prioritized for slum development and rehabilitation instead of the 2011 regulations. For rural areas with a population density of over 2,161 persons/sq km, the “no-development buffer zone” be limited to 50m from the High Tide Line (HTL). For other areas, the buffer has been recommended at 200m from the HTL. 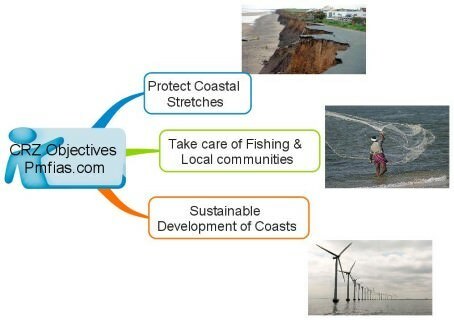 Allowing reclamation of lands for specific infrastructure such as ports, bridges and fisheries-related structures for the “larger public interest”. permanent structures on the landward sides of national/state highways.